The question of whether the Late Jurassic dino-bird Archaeopteryx was an elaborately feathered ground dweller, a glider, or an active flyer has fascinated palaeontologists for decades. Valuable new information obtained with state-of-the-art synchrotron microtomography at the ESRF, the European Synchrotron (Grenoble, France), allowed an international team of scientists to answer this question in Nature Communications. The wing bones of Archaeopteryx were shaped for incidental active flight, but not for the advanced style of flying mastered by today's birds. Was Archaeopteryx capable of flying, and if so, how? Although it is common knowledge that modern-day birds descended from extinct dinosaurs, many questions on their early evolution and the development of avian flight remain unanswered. Traditional research methods have thus far been unable to answer the question whether Archaeopteryx flew or not. Using synchrotron microtomography at the ESRF's beamline ID19 to probe inside Archaeopteryx fossils, an international team of scientists from the ESRF, Palacký University, Czech Republic, CNRS and Sorbonne University, France, Uppsala University, Sweden, and Bürgermeister-Müller-Museum Solnhofen, Germany, shed new light on this earliest of birds. Reconstructing extinct behaviour poses substantial challenges for palaeontologists, especially when it comes to enigmatic animals such as the famous Archaeopteryx from the Late Jurassic sediments of southeastern Germany that is considered the oldest potentially free-flying dinosaur. This well-preserved fossil taxon shows a mosaic anatomy that illustrates the close family relations between extinct raptorial dinosaurs and living dinosaurs: the birds. Most modern bird skeletons are highly specialised for powered flight, yet many of their characteristic adaptations in particularly the shoulder are absent in the Bavarian fossils of Archaeopteryx. Although its feathered wings resemble those of modern birds flying overhead every day, the primitive shoulder structure is incompatible with the modern avian wing beat cycle. 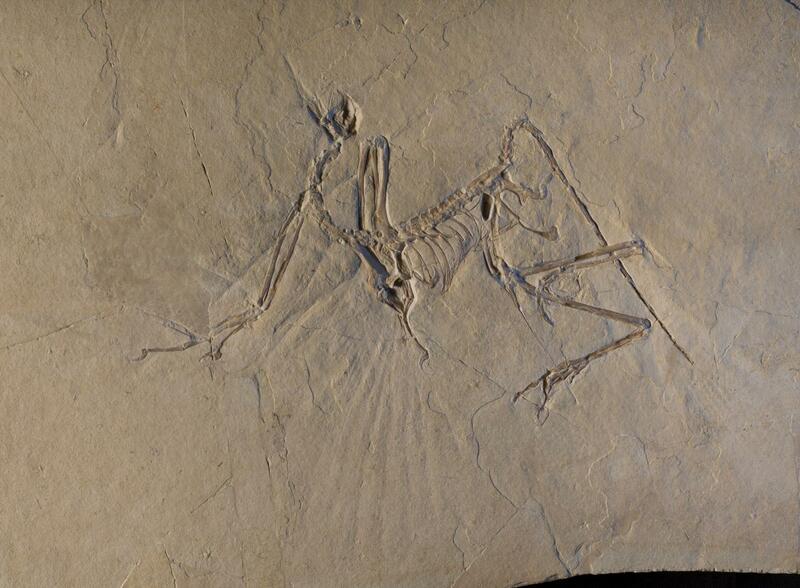 Archaeopteryx skeletons are preserved in and on limestone slabs that reveal only part of their morphology. Since these fossils are among the most valuable in the world, invasive probing to reveal obscured or internal structures is therefore highly discouraged. "Fortunately, today it is no longer necessary to damage precious fossils", states Dr. Paul Tafforeau, beamline scientist at the ESRF. "The exceptional sensitivity of X-ray imaging techniques for investigating large specimens that is available at the ESRF offers harmless microscopic insight into fossil bones and allows virtual 3D reconstructions of extraordinary quality. Exciting upgrades are underway, including a substantial improvement of the properties of our synchrotron source and a brand new beamline designated for tomography. These developments promise to give even better results on much larger specimens in the future". Scanning data unexpectedly revealed that the wing bones of Archaeopteryx, contrary to its shoulder girdle, shared important adaptations with those of modern flying birds. "We focused on the middle part of the arm bones because we knew those sections contain clear flight-related signals in birds", says Dr. Emmanuel de Margerie, CNRS, France. "We immediately noticed that the bone walls of Archaeopteryx were much thinner than those of earthbound dinosaurs but looked a lot like conventional bird bones", continues lead author Dennis Voeten of the ESRF. "Data analysis furthermore demonstrated that the bones of Archaeopteryx plot closest to those of birds like pheasants that occasionally use active flight to cross barriers or dodge predators, but not to those of gliding and soaring forms such as many birds of prey and some seabirds that are optimised for enduring flight." "We know that the region around Solnhofen in southeastern Germany was a tropical archipelago, and such an environment appears highly suitable for island hopping or escape flight", remarks Dr. Martin Röper, Archaeopteryx curator and co-author of the report. "Archaeopteryx shared the Jurassic skies with primitive pterosaurs that would ultimately evolve into the gigantic pterosaurs of the Cretaceous. We found similar differences in wing bone geometry between primitive and advanced pterosaurs as those between actively flying and soaring birds", adds Vincent Beyrand of the ESRF. Since Archaeopteryx represents the oldest known flying member of the avialan lineage that also includes modern birds, these findings not only illustrate aspects of the lifestyle of Archaeopteryx but also provide insight into the early evolution of dinosaurian flight. "Indeed, we now know that Archaeopteryx was already actively flying around 150 million years ago, which implies that active dinosaurian flight had evolved even earlier!" says Prof. Stanislav Bureš of Palacký University in Olomouc. "However, because Archaeopteryx lacked the pectoral adaptations to fly like modern birds, the way it achieved powered flight must also have been different. We will need to return to the fossils to answer the question on exactly how this Bavarian icon of evolution used its wings", concludes Voeten. It is now clear that Archaeopteryx is a representative of the first wave of dinosaurian flight strategies that eventually went extinct, leaving only the modern avian flight stroke directly observable today.